Dean lives in Kanab, one of the larger cities in Kane County, where he volunteers to help the community by fighting fires, searching for stranded hikers and teaching search and rescue to other Kane County volunteers. 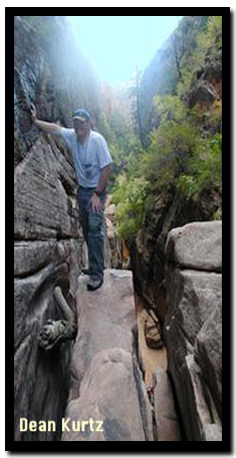 In Dean's free time he hikes, canyoneers and explores the vast lands of Kane County and the nearby parks. 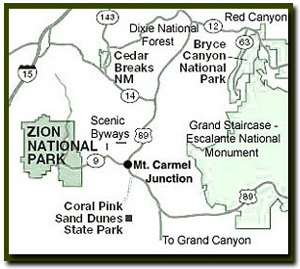 Lead instructor for the ACA's Wilderness and Canyon First Aid and First Responder programs. Kane County SAR Vice-Commander and training officer enjoying Water Canyon and Canaan Mountain in his free time. Three boys had gone to play in Red Hollow, in January, in short sleeves and jeans. When it started to get late two of the boys came home, but the another boy wanted to stay. Obviously, once it got dark and nobody had seen him for hours, the family got nervous and we were called. This call was pretty scary. We searched most of the night in 30 degree temperatures, knowing that he didn't have a coat or any other means to stay warm. I was in the bottom of one of the forks of Red Hollow with two others when he was located in a very steep drainage near the top of the hollow at about 3:00 a.m. He had tried to climb out when it was still light, but he couldn't make it all the way to the top, once it got dark he continued to travel along the ledges. Eventually he lost his footing on an edge and took a 50' fall onto a very steep, unstable slope. Myself and the two others happened to be about 200' directly below him. We made the climb to him where we evaluated his condition. He had hit the back of his head on a rock when he fell, which had caused a good deal of bleeding that had since clotted on its own. He also complained of pain in his leg and ankle. My assessment led me to believe that he was also severely dehydrated and hypothermic. We wrapped him in two of our coats, put a helmet on him and began the VERY long and tedious task of bringing him down the slopes and cliff bands that we had just climbed. I carried him myself most of the way down, using my back and pack to shield him from the rocks that were constantly coming loose. I got hit more times by falling rocks in two hours that night than in the rest of my life combined. waiting vehicles at about 5:00 a.m. The boy went to the hospital and indeed had a broken leg, a concussion, hypothermia and was very dehydrated. I'm very proud of that particular rescue. I've been on hundreds of combined searches, fires, and ambulance calls, and I've participated in many calls that are considered saves by our services. This call, though, is the only one where I feel like every move that I made had a direct impact on that child surviving. I fully believe that had we not got to him when we did that he would not have survived to daylight.